This tutorial will show you how to add a translation widget to your page. It will take you to a translation of the current blog page. What's more it uses Google Translate and offer instant access to automatic translations of that page. Adding the gadget is quick and easy too. Login to your Dashboard> Layout> Add a Gadget (sidebar - just matter of your preference). Copy and paste the HTML below to include the gadget on your webpage. Save the changes and you're done! You should see it on your sidebar now. 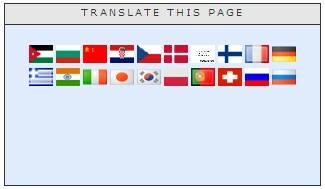 It will show up on your site letting visitors know that they can "translate this site" in a variety of languages including German, Russian, Portuguese, and Chinese. Posted by Is | at 1:54 PM | Labels: Blogging Tips | Estou lendo: Add A Translation WidgetTweet this! | Feed.